Nothing ever vanishes completely from the Internet. Whether a web page has been down for a few minutes or a few years, there are a few ways you can view its content anyway. Google and other search engines download and keep copies of the web pages they index. if a web page is down, you can easily view the most recent copy cached by Google. If you’re trying to access a web page from Google search, it’s easy to access the cached copy. Just click the back button in your web browser when the web page doesn’t load. Click the arrow to the right of the web page’s address, and click “Cached” to view the old copy. If the page appears to be taking a long time to load, you can click the “Text-only version” link at the top of the cached page. The web page will load instantly, but you won’t see any images. This is necessary when the website’s server is down and your browser can’t load the web page’s images. You’ll also see the date and time when Google created this cached copy displayed at the top of the page. 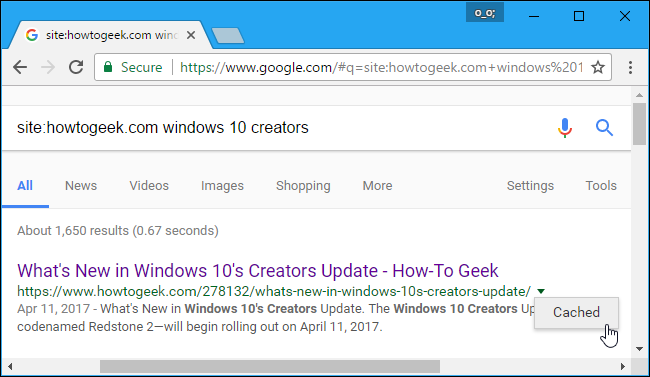 There’s also quick way to view Google’s cached copy of any web page without going through Google search first. Just plug the following address into your address bar, replacing example.com/page.htm with the full address of the web page you want to view. While we focused on Google Cache here because most people use Google, Microsoft’s Bing search engine has its own similar feature. If you use Bing, you can click the down arrow to the right of an address and click “Cached page” to view a copy from Bing’s cache. To use the Wayback Machine, head to the Wayback Machine page. Plug the full address of the web page you want to view into the box and click “Browse History”. For example, you can copy and paste this address from your browser’s address bar if a web page doesn’t load. 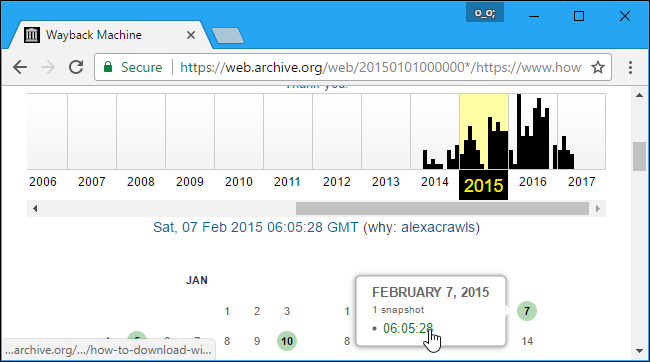 If you just want to view the most recently cached copy of a web page, you can click the date at the top of the archive page. If you want an older copy, you can select a year and click a date on the calendar to view the web page as it appeared on that date. You can click links that appear on the page after it loads to view other web pages as they appeared on that date. This tool allows you to browse entire websites that have disappeared or changed dramatically. You may also have heard of CoralCDN in the past. CoralCDN was particularly useful for viewing cached copies of web pages that went down due to sudden high traffic. However, CoralCDN is now shut down. The above two tools should get you pretty far, though.